Sources: Gingrich Will End His White House Bid Next Week : The Two-Way Sources are telling media outlets that the former House speaker will soon exit the campaign and that it's highly likely he will endorse Mitt Romney. 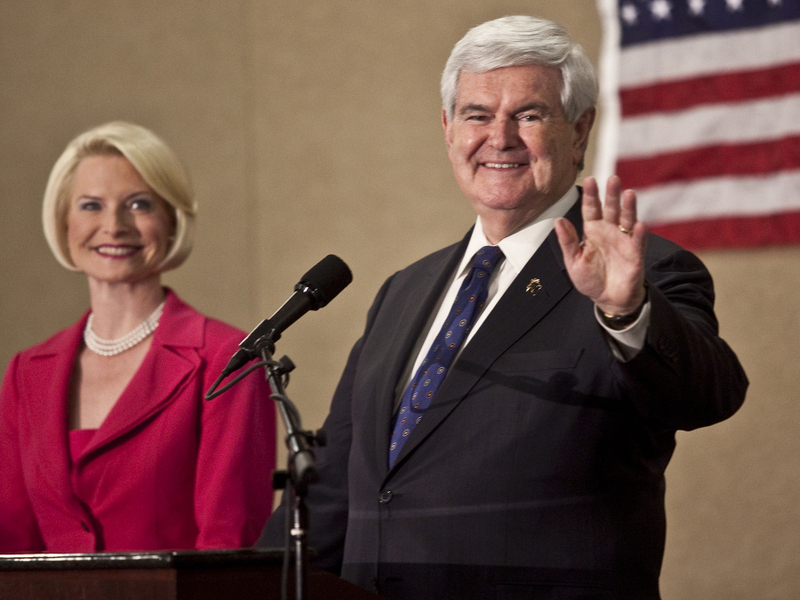 Republican presidential candidate Newt Gingrich and his wife, Callista, Tuesday night in Concord, N.C.
Fox News reports that "senior Gingrich aides" say former House Speaker Newt Gingrich "plans to formally suspend or end his presidential campaign next Tuesday." CNN writes that "sources close to Newt Gingrich say he will end his bid for the GOP presidential nomination next week." USA Today's On Politics blog notes that "Gingrich told a North Carolina audience today that he's 'working out the details of our transition.' "
NPR is reaching out to its sources for more on this news. Tuesday, presumptive Republican nominee Mitt Romney swept all five primaries — including in Delaware, where Gingrich had hoped to pull off a victory. Update at 10:52 a.m. ET. Source Says It Will Happen Next Tuesday. "A source close to the campaign says that on Tuesday, Newt Gingrich will announce the suspension of his campaign and that it's highly likely he will endorse Mitt Romney."